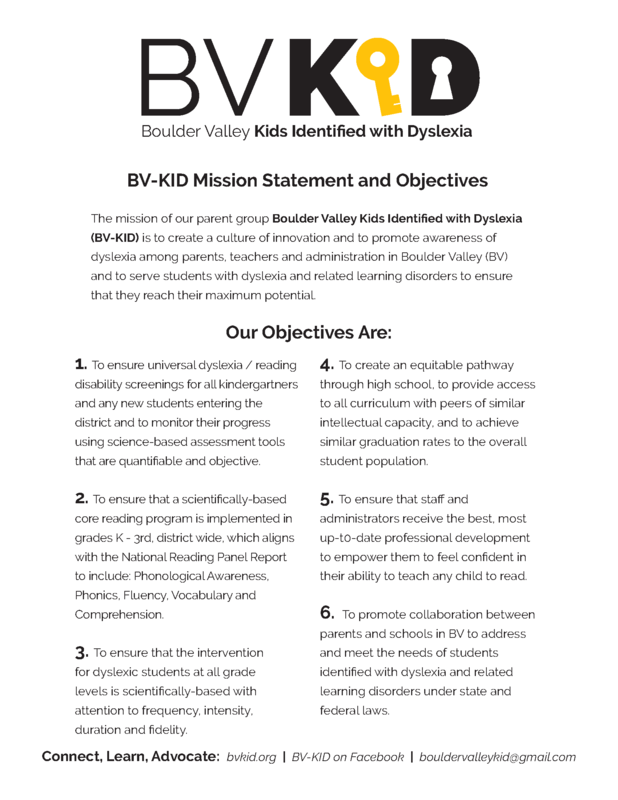 The mission of our parent group Boulder Valley Kids Identified with Dyslexia (BVKID) is to create a culture of innovation and to promote awareness of dyslexia among parents, teachers and administration in Boulder Valley and to serve students with dyslexia and related learning disorders to ensure that they reach their maximum potential. 1. To ensure universal dyslexia/reading disability screenings for all kindergartners and any new students entering the district and to monitor their progress using scientific-based assessment tools that are quantifiable and objective. 4. To create an equitable pathway through high school, to provide access to all curriculum with peers of similar intellectual capacity, and to achieve similar graduation rates to the overall student population. 2. To ensure that a scientifically-based core reading program is implemented in grades K – 3rd, district wide, which aligns with the National Reading Panel Report to include: Phonological Awareness, Phonics, Fluency, Vocabulary and Comprehension. 5. To ensure that staff and administrators receive the best, most up-to-date professional development to empower them to feel confident in their ability to teach any child to read. 3. To ensure that the intervention for dyslexic students at all grade levels is scientifically-based with attention to frequency, intensity, duration and fidelity. 6. To promote collaboration between parents and schools in BV to address and meet the needs of students identified with dyslexia and related learning disorders under state and federal laws.